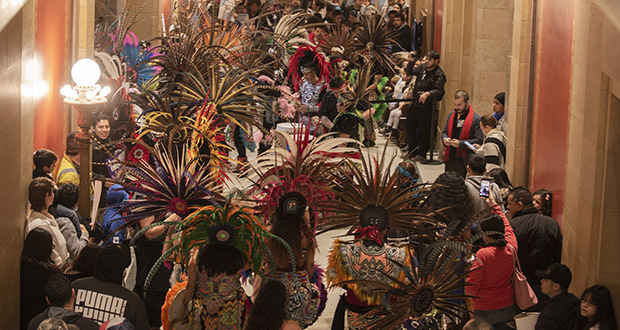 Kalpulli Ketzal Coatlicue, a traditional Aztec dance group from Minneapolis, came to the Capitol arrayed in colorful costumes and headgear and accompanied by ear-splitting percussion on April 5. They turned out to demonstrate in favor of the DFL-backed House File 1500, the “Driver’s License for All” bill, which passed the House 74-52. The dance troupe’s Capitol appearance was organized by its leader, immigration attorney Susana De Leon. Two Republicans, Rep. Rod Hamilton, R-Mountain Lake, and Rep. Dave Baker, R-St. Cloud, joined the Democrats in voting for the bill, which allows non-citizens to obtain state driver’s licenses even if they can’t prove they are in the United States legally.